[Mary] turned to leave and saw someone standing there. It was Jesus, but she didn't recognize him. "Dear woman, why are you crying?" Jesus asked her. "Who are you looking for?" She thought he was the gardener. "Sir," she said, "if you have taken him away, tell me where you have put him, and I will go and get him." "Mary!" Jesus said. She turned to him and cried out, "Rabboni!" (which is Hebrew for "Teacher"). Jesus had said that his sheep know his voice. Indeed, they do. 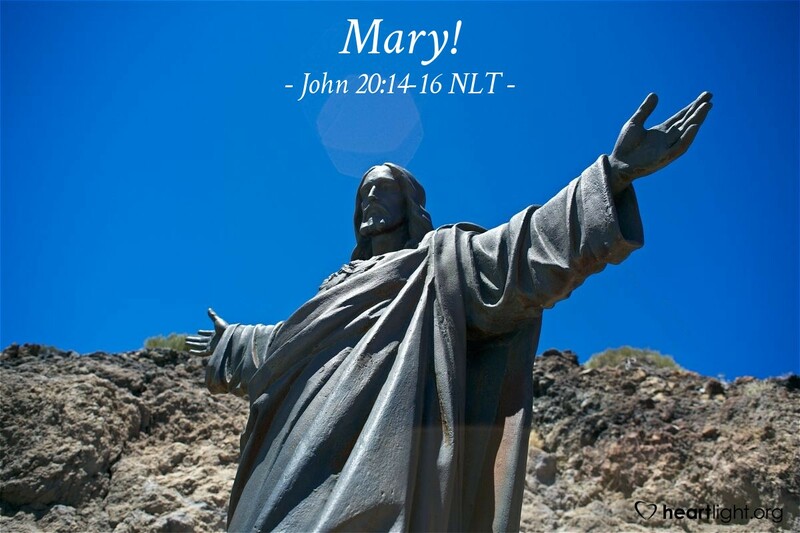 While Mary did not recognize Jesus at first, as soon as he said her name, she knew! One of these days Jesus will say each of our names, and the faithful will rise to meet him and go home to live with him forever. Our assurance of this future is rooted in what Mary was beginning to realize — her Lord had died, had been buried, and now was raised. Because of Jesus' victory over death, we can have confidence in his promise to each of us of life with him forever. Almighty God, how can I thank you for such a wonderful hope! Thank you for Mary, whose faith held firm through her sorrow, despair, and confusion. Thank you for her experience, which helps me anticipate the day when Jesus will say my name, and I will see him face-to-face. In the glorious name of my Lord and Savior, Jesus Christ, I pray. Amen.